He watches over me, leading the way when the storms of life are coming. When there is no way around it and the only option is to put my head down and plow through it, He is there. I will not travel through this alone because He is leading the way, guiding me and protecting me from whatever this storm will bring. I do not have the strength to go it alone and He makes sure I do not have to face troubled times and stormy weather without Him. He gives me direction when I’m lost, and tells me when I should face the storm and when I should go around it. I trust Him. When the dark clouds are approaching, our first instinct is to avoid them. We worry what might happen and wonder how we can get around it, because we get so caught up in what might happen we forget to have faith. The darkness and power of what’s coming makes us forget to appreciate the beauty in it. It is the experiences in our lives that made us who we are and we must remember that we will not go it alone. No matter how hard or bad it is, it too will end and a brand new beautiful day will dawn, giving us a better understanding of not only who we are but what we can handle. It always surprises me in how much we can handle. When you are heading down that road in your life and you see a storm fast approaching, take a moment to look around and see who is going to ride it out with you. We hope that our friends and family will be there for us, and they will. But see who is leading, guiding and protecting you when it’s about to hit. It’s not always obvious, sometimes you have to look around for signs of His presence to see it for yourself. My ride to work always gives me time to think about the day, week or life in general. As if I’m in some sort of meditative state, I can reflect on things and take a few minutes to figure it all out and put it into perspective. We all know our lives, as predictive as they may seem, are really unpredictable. It is this mind-clearing experience of riding to work where I do my best thinking because I’m alone with my thoughts and distractions are minimal. Sometimes it’s the obvious that we are quick to miss. 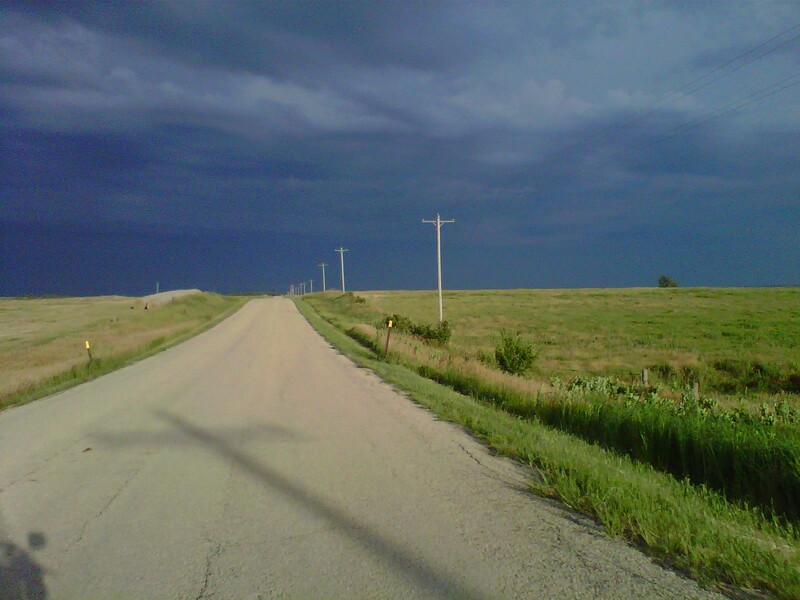 I took this picture of the storm in the horizon unaware of the shadow being cast on the road before me. It may seem random to some and it may not even mean anything to others, but to me it was God telling me things were going to be alright. It is the open mind and open heart that hears the answers to questions we have, and today that question was answered. ← Are Your Jeans Dry? I often think about what it would be like if we were within a few miles of each other and had the opportunity that you three have of being close and life-long friends. A beer sounds good right now!